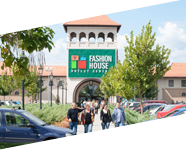 FASHION HOUSE Outlet Centre Bucharest, the first professional outlet centre in Romania, is off to a great start in 2018. Four new partners have joined list of the scheme’s tenants, taking a total of 1,285 sqm of retail space. The latest addition to the already strong lineup are: Koton, TinaR, Exclusive VN and English Home. Koton is an international fashion brand with roots in Turkey. With its creative, innovative, customer- and technology-oriented approach, Koton adopts the policy of bringing seasonal trends together with authentic designs. It offers a wide range of collections for women, men, kids and babies. 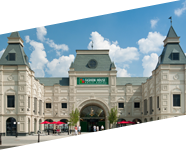 The tenant has decided to lease 833 sqm of retail space in FASHION HOUSE Outlet Centre Bucharest. The next two new tenants are local fashion brands of strong reputation in Romania. TinaR and Exclusive VN have taken 173 and 148 sqm respectively. What is more, English Home has leased 131 sqm. Beyond its classical English style, English Home offers products to create the dream of consumer’s bedroom, bathroom, kitchen and living room. FASHION HOUSE Outlet Centre Bucharest, opened in 2008 within West Park Retail, is the first outlet centre in Romania, developed by FASHION HOUSE Group, part of Liebrecht & wooD Group. Strategically located next to Bucharest’s ring road and with direct access from the A1 highway, it can be reached in a mere 30 minutes’ drive time from the city centre. 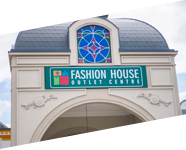 FASHION HOUSE Outlet Centre Bucharest has over 15,500 sqm GLA and an ample parking with 2,150 parking lots. The scheme’s tenant mix includes such brands as: Puma, Adidas, US Polo, Champion, Stefanel, Collective, Mango, Kenvelo, Tom Tailor, Benvenuti, Il Passo, Ecco, Camel Active, Diesel, Lee Cooper, Guess, Napoleoni, TED’s Coffee, Lacoste & Gant, Desigual, Triumph, Levi’s, Motor Jeans, Casa Convenienza and many others. 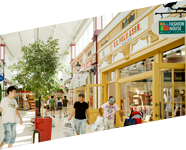 With 30% to 70% discounts all-year-round on branded fashion items FASHION HOUSE Outlet Centre Bucharest perfectly completes the offer of West Park – one of most popular retail parks in Bucharest, known from its broad household goods offer.